With the expansion of the railway network ever gaining momentum and amid the hustle and bustle of every MTR journey, what lies behind the smooth flow of the urban arteries? 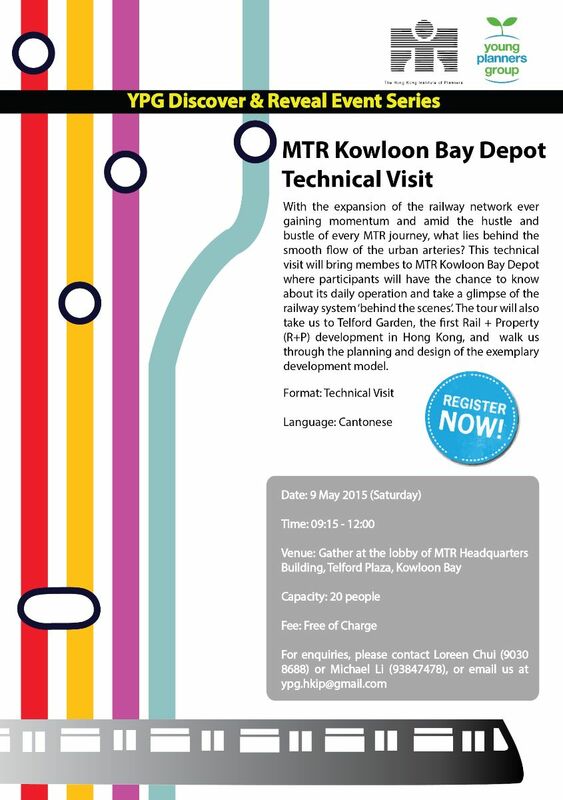 This technical visit will bring members to MTR Kowloon Bay Depot where participants will have the chance to know about its daily operation and take a glimpse of the railway system ‘behind the scenes’. The tour will also take us to Telford Garden, the first Rail + Property (R+P) development in Hong Kong, and walk us through the planning and design of the exemplary development model. Registration is on a first-come-first-serve basis. We will notify you of the registration result once it is confirmed. Should you have any enquiries, please contact Michael Li (9384 7478) or Loreen Chui (9030 8688), or email us at ypg.hkip@gmail.com. We look forward to seeing you at the visit!